So gorgeous and always such a Monday treat. I appreciate hearing from you Ann and enjoyed catching up on your academic quilting symposium. I remember loving Yuletide when I saw it on blogs last year. Gorgeous! Your perfect arranger is a brilliant idea and the second arrangement is a delight. In general I’m not a fan of mixing red and yellow but Yuletide pulls it off well. I am pleased with the arranger tool and it made a great excuse to treat myself with more flowers. Yuletide is lovely and is available here, I am very tempted! I like the simplicity of the blue vase but am envious of the ‘perfect arrangers’; I know in theory you can use chicken wire, but it isn’t always so easy to use and I often catch my fingers on the cut wires. A treat of some cut flowers when they are as lovely as yours is nothing to apologise for. Thanks. You’d enjoy the arranger tool Christina. It worked as promised and I hope it will hold up well. It’s even dishwasher safe, something I don’t expect to ever test! I did have trouble fitting it into some of the first vases I tried, which surprised me, so I won’t be able to use it in every situation. Beautiful displays. I have never seen that arranger before and now I am going to have to go shopping. Looks like a great addition to my stash of vase-related items! Thanks Linda. Yes, we can always use more vase-related tools. The arranger made it simple and quick to create a design. I’m definitely glad to have discovered them. Hope it holds up. I do love the color of the Camellia and can see why it is called Yuletide. Love learning more about arranging and seeing your new toys. I will have to look for them. Your experiment was a stunning success. Wonderful Susie! Thank you Donna. Yuletide must bloom somewhere nearer to Christmas where it would mix well with holly, but mine is done by then usually. Yes, new toys are always fun. Such a great post, Susie, lovely flowers and new toys! Thank you! I have exactly the same colour of stocks in my garden and they are still in bloom now. Thanks Anca. I wish I could say I had grown the stock but I purchased it. Next year I plan to try to grow it though. Nice that you’re still enjoying yours in Nov. I grew Yuletide in my garden in Chapel Hill and loved it. A very prolific bloomer. You can be sure that I am quite partial to your “Perfect Arranger;” I have one I rather like myself. Ha! You have the best perfect arranger ever devised! Than you Cathy–that blue vase is one of my favorites. Good idea to check online for the arranger. I was glad it worked so well, since I bought it in two sizes. The “perfect arranger” is just that! I’ll have to look for it. Your Camellias are gorgeous specimens. Mine were finally looking a bit better as our daytime temperatures came down but now the wind is blowing them to pieces. Thanks Kris. I was worried the camellias would all be damaged by the frost but found enough new ones for a small display. You can’t seem to catch a break with your weather. That line connected with me also Judy. A lovely arrangement. The perfect arranger looks like a good idea. Thanks Brian. I enjoyed using the arranger. It’s always nice to have some tools to hep get the job done. Truly a beautiful cameilia. I love the fragrance of stocks. That sounds vaguely mercenary. Yes that phrase could turn heads. This stock was purchased along with the roses and neither is fragrant. I’m planning to try to grow stock next year. My garden mentor used to always have it in her garden and I don’t know why I haven’t thought to try it myself. I am admiring your lovely Yuletide flowers. I got Yuletide and Apple Blossom camellias 16 years ago, and AB has been blooming several years but Yuletide is a hold-out, though I thought I could see one bud on it this year. The perfect arranger did such a good job, the lovely flowers are held out all separate and make a fancy florist’s style arrangement, Susie. Thanks Hannah. I think a benefit of that arranger is exactly what you mentioned. It makes it easier to separate the flowers and achieve an airier arrangement. I have my fingers crossed your Yuletide will surprise you this year. Your Yuletide camellia is on my wishlist Susie – I said last week that I must get some early flowering camellia and your vase has confirmed it! I will be looking out for one or two before Christmas. I have the large and small Perfect Arrangers too! I bought them at Chelsea a few years ago. I have to admit that I have not used them this year – I really must go and dig them out again. Thanks Julie, hope you find a perfect specimen of Yuletide. Mine has been reliable and requires no care. Interesting you also have the arrangers. Perhaps mine will also end up in drawer somewhere eventually, but for now I really like it. I love the simplicity of the single Camillias…and the simplicity of putting several of them in that electric blue jug is inspired. Thanks Ricki, that little blue vase is a favorite color of mine. Seems to work with many different flowers. Thank you Ben. I’m really enjoying the arrangements in the house this week. The Camellias are so pretty. Sigh….. Can’t grow them in my garden I’m afraid. I am intrigued by your new arranger gadget and must scour the internet as I need something like that – many of my vases have such wide openings and I find I am filling them with extra ‘bulk’ or foliage just to get things to stand up! Thanks for sharing Susie! Your arrangements always look so nice Cathy, but I know what you mean about using the foliage to help hold things in place. That can be a good technique too but I found this arranger widget saved a lot of time. Love your arrangements and that arranger is a great idea for a Christmas present. I wonder if I can find one. Thanks Annette. You can probably find the arranger or something similar online. I picked these up at a non-profit garden shop run by a garden council. Actually I have already looked and can’t see anything that looks so good over her in the UK. Shame – they would have been good Christmas presents. Hi Annette. I scoured the web too looking for this. Not sure why it’s so hard to find. Did come up with one site you might try. Good luck! If this doesn’t work maybe Ikebana pins would be a goo substitute for your gifts. Wow – I’m impressed that you found it as I had spent quite a lot of time looking already. Thank you so much – I have bookmarked it and put it on my Christmas list. 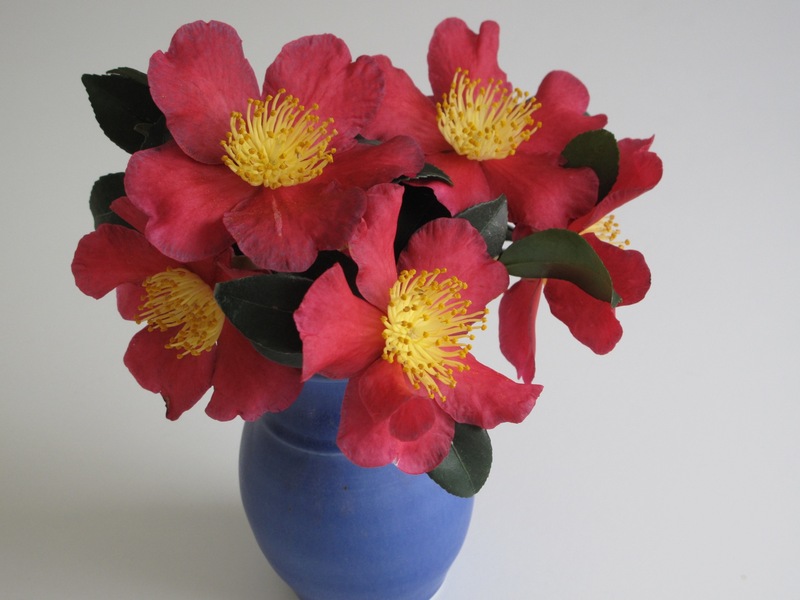 Do your camellias flower for Christmas or will they be gone by in Dec? What a perfect name for them. Your photos of both vases show beautiful details. The roses are lovely – can’t beat that price. I was told that there is an abundance of Columbian roses on the market as they cut them back now so they will yield for Valentine’s Day – definitely La Dia de Rosa! Nifty arrangers you picked up and clearly they work perfectly! Eliza, Yuletide usually still has a few blooms in the first part of January. I read the same thing about those Columbian roses–getting ready for Valentine’s. such a pretty Camelia and the colour works so well against the blue vase. I have never seen the Perfect Arrangers before, but think I might add them to my Christmas list! Thanks Ann. That blue vase seems to work with many different colors of flowers. The arrangers seem to have touched everyone. I did find it easy to use. Hope Santa reads your wish list.